The Municipal House represents the most significant feature of the Prague Art Nouveau period, and which is also the seat of the Prague Symphonic Orchestra. 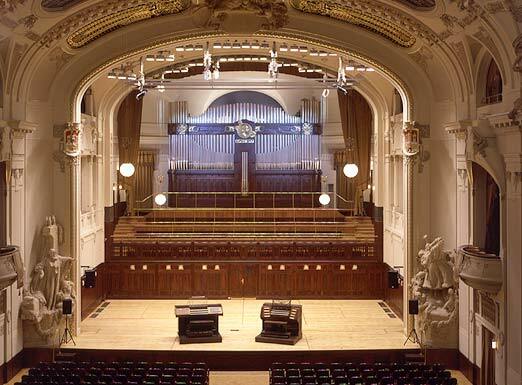 The concert halls of the Municipal House is one of Prague´s most impressive and significant concert halls, primarly due to superior acoustic and its magnificient Art Nouveau interior. The building is crowned by the outstanding decor created by most of the prominent Czech artists of the day, namely the painters and the sculptors: Alfons Mucha, Max Svabinsky, Frantisek Zenisek, Bohumil Kafka, Josef Vaclav Myslbek. The Municipal House is situated in the center of Prague at Namesti Republiky square, near to the metro station "Namesti republiky" ( line B ). Concerts halls are heated / air conditioned. No barrier to entry for handicapped. Lift. equipped with arched lamps made by F. Križik, have been replaced by replicas made according to photographs taken in 1912.